I have seen something that I really wish I could take a photo of. One of the highlights of my year is when I go on our yearly Word Rider tour. This is a project of the South African Bible Society, when about 60 of us, from all over the country, gather around to go to one region, and visit the outbacks, the schools in the rural areas of South Africa where no tourist ever goes. We visit, and give every grade 7 learner in the school a brand new bible in the language of their choice. We get to have a good conversation with these kids, and to pray for them. This year’s tour started in the world famous surfing town of Jeffereys Bay. And if you have ever been there, you probably would not have noticed- just behind the surf shops is a township, where very poor people live. This whole province of the Eastern Cape is one of the most poverty stricken parts of our country. It is heartbreaking to see towns where unemployment is as high as 97%. The people have lost hope of ever finding a job again. The kids are living in these circumstances. They have big hopes and dreams. But many towns only have a primary school, and the nearest secondary school might be 100 km away, the hostels too expensive and bus transport unavailable or unaffordable. So many of these kids just get to leave school after grade 7, and go home sitting around, waiting for better days to come. After the Camino in July 2018 I went through some pretty serious times in my life. I knew this would be a year of transformation, and that I need to take a few steps to get my own life in order. Since October I have gotten much more serious in my walk with God, with a daily time of devotion that was booked into my diary. I grew a lot in leadership since discovering Carey Nieuwhof’s podcast, and reading up on a lot of his guests, buying their books where I can. Books that influenced me a lot; Carey Nieuwhof’s “I didn’t see it coming,” Andy Stanley’s “Irresistable”, Francis Chan’s “Letters to the Church” to name just a few books I worked through in these times. I have also been exercising a lot. I was walking about 6 km two times a week, and then started cycling again. Last week I was on the bike for three 31 km sessions. Spiritually and physically it was a few months of growth in my life. I am starting to feel fit again, more optimistic, more useful. But then: last Friday I landed in hospital. My appendix was gone, in a bad shape, and seriously threatening my health. It had to come out immediately. So I had to go to our capital city and got the operation the same day. I had to spend the next 4 nights in hospital, to go through the complete course of antibiotics. I finally got out of hospital yesterday. Feeling much better, but moving really slow. I am taken off cycling for the next 6 weeks. It is a huge problem, for I was training to compete in the Cape Town Cycle tour in 10 weeks time. It will be my 22nd race, but it will be the first with one of my children. I do not know if I will be able to salvage my own ride at this stage. Ok, so the post Camino blues has been severe this time… I have stopped walking. Big mistake. I need to keep on walking. And to do that I need a goal to work towards. I have walked the Camino Frances from Leon to Santiago in 2011. It took 7 years to get to my second Camino, the Portuguese, this year in June and July. I did not have any walking goals since coming back home. But this morning, as I was sitting with our great South African Afrikaans travel magazine, Weg, I started reading Gerda Engelbrecht’s article on her recent pilgrimage- the Via Francigena. And old pilgrims know the feeling- a spark went off. A Eureka moment in the mind. I almost wanted to run naked through the streets like Archimedes, or who was it who did that? Last night I held an info meeting for our town on how to plan to walk the Camino de Santiago. And this morning the penny drops- exactly the same way I should plan to do the Via Francigena. First I will have to save, I don’t know how much will be needed yet. But I paid over ZAR 100 into my credit card just to make a start. A very small seed but I planted it. And now I will squirrel small amounts away for the next few years, till it is almost enough. I have found the official website on the Via Francigena , I will start reading all I can on the subject. I will get to know the route as good as I can from a distance. I do have all the equipment I need. I will start walking again, training to be fit for whenever the opportunity arrives. I will focus on my dream, looking forward, taking it day by day till I stand in Rome. I do not know how long it will take, but the journey has started this morning. All I needed was a new dream… back on my feet again! PS- Any of you who have walked the Via Francigena- any info and pointers will be much appreciated, I know nothing yet… What is the best book to read, what is the John Brierley equivalent to the Via Francigena? PPs- Dankie Gerda Engelbrecht, soos jou kollega Erns Grundling maak jy weer groot moeilikheid in my kop! It is 03h33 on a Friday morning. I see it has been 2 months since my last entry into my blog. Maybe I owe my 3 trusted readers an explanation. The Camino de Santiago is one of life’s peak events. It takes you out of your normal world, and brings your whole existence back to basics. Eat, walk, pray and sleep.While eating wonderful local cuisine and meeting amazing people from around the world. the Camino is a training ground for the real walk of life. In a sense the Camino prepares one for the difficult times that may follow. And since my last blog post life was one hell of a bumpy ride. I am a white South African. Afrikaans speaking. Born that way, nothing I can do about it. I live in South Africa with all it’s history. Good and bad. In a beautiful country with some of the most violent people imaginable. we have one of the highest murder rates in the world. Some people try to soften it with statistics. But in our country 57 people are murdered every day. It is just a number. Until it becomes one of your own included in that daily tally. My brother in law was a peaceful man, who believed in the reconciliation between races with all his heart. He was a church leader teaching forgiveness and peace (as, I hope, am I…). He was a Professor in our language, and a very good poet. He played a huge role in many people’s lives, including mine. One evening he and his wife came home after having a meal at my mother in law’s house. they live in a gated community that was supposed to be secure. They walked into a burglary in their home, by 7 armed men. They shot and killed him, and fled with a laptop computer and two cell phones. Nothing has been heard since about any arrests. This is the daily experience of life in South Africa. Your life is not worth much more than a cell phone or a computer around here. And through all the tears we have to keep on trying to build a broken country with hate filled people, forgiving and moving forward. Politicians argue about the crime statistics. You don’t give a damn if the murder rate is down 90% , if your family is included in the 10 %. But the murder rate does not come down, it is going up, and up, and up. I have a hard time dealing with this. Two days later my daughter flew to China, to go and help teach English. I will see her again in a year’s time. She wrote a heart breaking post on facebook yesterday about not feeling safe in South Africa, and being safe in a foreign land but missing home. And I miss her a lot. My eldest son is finishing his B.Comm degree, and then he wants to go back to the USA to drive combine harvesters. A farm laborer in America has a better income than a young graduate in South Africa. My second son is on a combine harvester in Canada at the moment. I will see him next (2019) December again. And the youngest is finishing high school next year. So, dear reader- the Camino tried to prepare me for this. I just have to keep on walking through every day, just keep on step by step, till we reach a better place. But the black monster is back. And- for the politically correct in South Africa and the USA- this is not a person with a certain skin color. The Camino is such a lovely experience- nobody is shooting at you. One week ago today we started flying back home from Madrid after our Portuguese Camino. It was a very hot day in Madrid, and even more hot when we stood over in Doha. Flying into South Africa we landed smack bang into winter. And since stepping off the plane, it feels like we are in a permanent cold front in our home town. It was extremely cold so far relative to our normal weather. And then we came back..
We finally arrived, and booked into the Pension Mirador Fin de Terre. What a lovely view! After we have showered and we have taken a little siesta, it was time to finish our journey. We walked up to the lighthouse, the most westerly point of Continental Europe. It is a long and steep 3 km uphill from Fisterra! But the view more than compensates for the suffering! As is customary (and forbidden according to some signs nearby) some people burned some clothing at the end of the journey, to symbolize the end of an old chapter in their lives. This ritual helps to draw a line in people’s lives… this is the end of this chapter. But a new chapter is dawning in your life, the journey of life continues. To symbolize this it was ritual to go jump naked in the ocean. Not at Finisterre, your body will wash up in America in 6 months’ time. At a beach, or as some have wondered:if I really jumped naked into the ocean behind the harbor wall in 2011? Well, not this time, no… my wife is with me and we are decent people! When you come down from the lighthouse, Fisterra is ready to feed you. This place has the most amazing variety of seafood. We love Fisterra, it’s harbor, it’s vibe and it’s people. 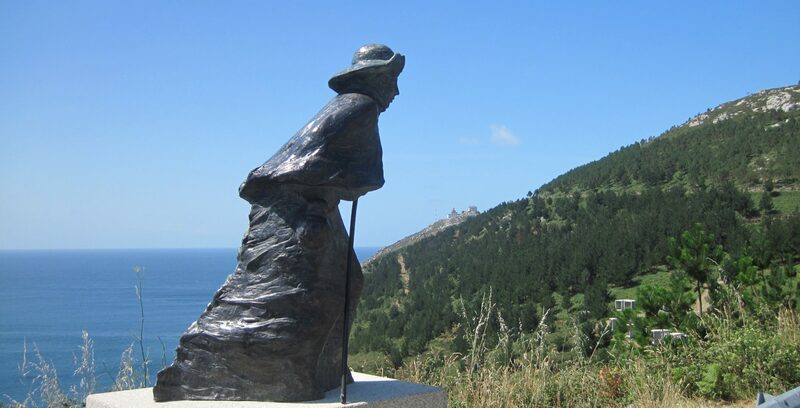 I am one of those who thinks that Finisterre just makes more sense as a final destination for your Camino. This is the end of our Camino at Finisterre. We have made it against all odds! There will be some reflecting on the experience in the days and weeks to come. We still have a lot of traveling to do before we get home on Saturday. There will be more blog posts in future. I will resume my normal day to day life as a rural pastor in South Africa next week. I will have a new dream one day.. But for now-This was our Camino. And I thank you who have travelled it with us, sharing in our story. The Camino has been going on since 980 A.D. It is open at this monent, with lots of Pilgrims on their Way to Santiago. IT is also waiting for YOU! If you ever plan on walking the Camino, put a couple of days aside at the end, and walk from Muxia to Fisterra, or the other way around. We planned to do that, but my wife’s feet were just causing too much pain. So, sorry, we took the taxi to Lires. But still- this part of Galicia called the Costa da Morte is beautiful! There were also no mobile signal and very little wifi available. So we just took a day to rest and relax. We did manage to walk to the beach (Playa da Lires) and it is good! Above the beach is a bar with good coffee and beer. We stayed over at Casa Raul and I would recommend it any time. The next post will be more exciting, because we just walked from Lired to Fisterra and that was GOOD! But now we are off to explore Fisterra. On Day 15 we rested. and still managed to walk more than 10 km in Santiago. We were now staying at Hospedaje O Padron, which is single metres away from the Pilgrim’s Office where you get your Campostela. We went back to San Martin Pinairo for another excellent Meal of the Day for just 11 Euros each. When we finished our botle of red wine, they brought another one! Best kept secret in Santiago, me thinks. Anyway, after seeing Emilio Estevez’ The Way movie I wanted to see Muxia. But we did not have time to walk, and our feet are gone… we took the 09h45 bus from the Autobus Station to Muxia, 8 Euro each. We arrived two hours later, and immediately fell in love with Muxia! You can not plan a Camino and not see Muxia! This must be the most beautiful exit out of a church building in the whole world! And it is a good symbolic end to our journey. We would have walked from Muxia to Lires to Fisterra. My wife’s feet are hurting so much that we will take the taxi instead. On to Fisterra on Monday. I have ended my first Camino there and it is awesome. But Muxia blew me away! Just resting a while, and then we will walk back to see the sun set at the church at around 22h00. Senor Snail used some NOS- he made it to Santiago! Will blog more soon, but that is enough for today. We made the evening Pilgrims Mass, and they swung the Butafumeiro… awesome! Just one last tip: If you ever walk the Camino, save money along the way. But the last night: Stay at San Martin Pinario just behind the Cathedral. And eat their Pilgrims meal the evening after mass. It will change your life! Early morning is beautiful on the Camino. The route from Caldas de Reys also does not disappoint. We exited town by way of an old Roman bridge. Asterix did say these Romans are crazy, but they could build infrastructure that lasted! We loved the parts through nature on today’s route. Today was also a bit hot, we really struggled to finish today. I have a little toe that had callused over in the beginning, it is now sporting a brand new blister. After a long day we arrived at our albergue-Cruces de Ilia. Beautiful and clean place. The hospitaliero told us more of the history of Padron. He also mentioned a special certificate (Pedronia) that you obtain by visiting the two churches of Padron, and get your Pilgrims Passport stamped there. You claim the certificate at the municipal albergue behind the church in town centre. The word ‘Ultreia’ (also ‘ultrella’ or ‘ultreya’) comes from Latin and it means ‘beyond’. Ultreia is another pilgrim salute, like the more popular ‘Buen Camino!’. While ‘Buen Camino’ literally means ‘have a good journey, a good Camino’, the meaning of ‘Ultreia!’ goes a bit deeper, implying encouragement to keep going, reaching ‘beyond’, heading onwards.